You have updated the work progressed in % complete field, but there is no Project field that will give you the planned % based on the status date. 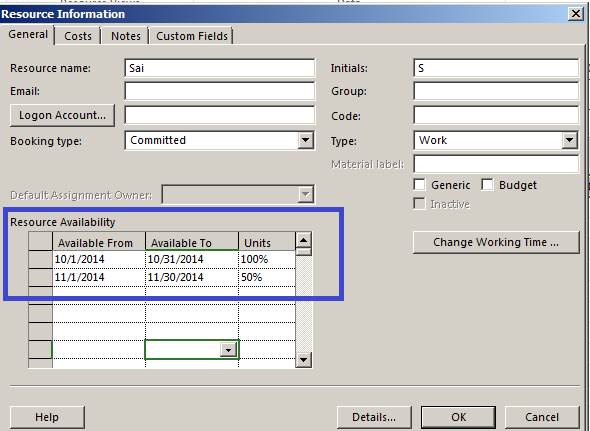 Create a custom field using a formula calculation the planned % complete, based on the status date. – Insert a Number1 field in Gantt Chart. – Right Number1 field and choose Custom Fields. – Insert a Text1 field in Gantt Chart. – Right Text1 field and choose Custom Fields. We prepare a project plan assuming the work will start on a particular date. You insert the tasks, dependencies, set constraints and deadlines to them. You will notice Project displays a series of alerts that certain tasks is scheduled before new project start date, and also constraint dates of some tasks will be invalid as they are with respect to earlier project start date. Now, you need to rework on changing the constraint dates and deadlines of tasks. Is there a better way to change the project start date that moves the constraint dates/deadlines relative to the project start date? Yes. You can use the Move Project command in Project ribbon. 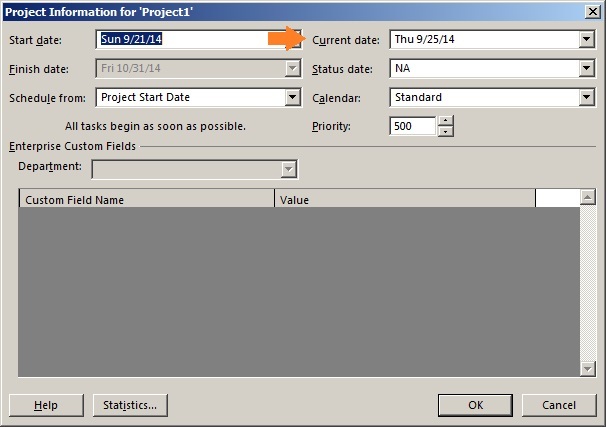 In Move Project dialog, enter the new project start date and also check Move deadlines. Though the check box label is "Move deadlines" this affects both deadlines and constraint dates. Now, Project will adjust the deadline date and constraint date relatively for all tasks. Don’t fear if your project is rescheduled. Your Move Project command is just a click away!! Tracking man-power utilization is very important for project success. Resource Sheet view helps you to define the resource information of your project. Double-click the name of the resource and define the resource availability to the project. After assigning this resource the task, Project checks the availability of the resource and marks the task with red color stick man if the workload is more or outside the availability in Gantt Chart view. This view doesn’t list how much the resource is loaded. You can use the Resource Usage view to know who does what work, and the work assigned with remaining availability. Based on the requirement, change the time-scale (View tab, Timescale: dropdown). Right click the time-phased portion to insert the Remaining Availability field. So, where are your resources are working hard and where not? Your team may have equivalent resources who can substitute each other. As a project manager, you can spend less time to maintain their details by consolidating their details. A project team has three support staffs to handle the customer queries. This is a self organizing team with equivalent individuals who can take tasks as much they can do. As a project manager, you want consolidate their details to be away from the individual details. In this plan, after the pilot support is complete the team can handle customer calls and reply to customer queries. You will now assign 1 "Support staff" to Pilot Support task, assign 2 "Support staff" to Answering customer calls and the remaining one resource to reply to customer queries. After assignment, split the view and bring the Resource Graph on the bottom. Resource Graph will help you to understand how the support staff are occupied in this project. Are you ready to consolidate your equivalent resources? Share your thoughts. When you have many options to do the same work, you need to choose the best option with least cost and more benefit. You have sequenced your tasks as Design, Build and Test. If you want to try with Build 1 estimates, select Build 2 and Build 3 tasks and inactivate them. You will now notice that Build 2 and Build 3 will no longer affect the schedule and the resource availability, this can help you to total estimate with Build 1 as the option. Now, you can try to activate and inactivate the other two tasks to know the best option. Are you one among those who think % Complete field indicates the real work that is completed? Are you someone who is looking why doesn’t Project update % Complete field every time the file is opened? Why should we have three fields to measure progress: Percent Complete (% Complete), Percent Work Complete (% Work Complete), and Physical % Complete when they should be same? % Complete field is calculated based on task duration. For instance, a 10 day task is 30% Complete at the end of the 3rd day from the start date of the task. This task is late if the % Complete is less than the expected value as the status date. % Complete is used only for task with duration based estimates. % Complete will vary when the user updates the remaining work and remaining duration fields. % Work Complete field is calculated based on the effort spent by the resources assigned to the task. For instance, a resource is assigned to 10 days long task. The first five days he plans to spend 4 hours per day and the remaining days he plans 8 hours per day. On the 3rd day of the task, the % Work Complete field will be 20% and % Complete will be 30%. On the other hand, if the effort is 8 hours per day across 10 days, on the 3rd day of the task % Complete and % Work Complete will be 30%. % Work Complete is used only for task with effort based estimates. % Work complete will not be same as % Duration complete the effort is distributed unevenly across the task. 1. Is this task estimated based on work or duration? 2. Is the value of work completed same as the duration or work completion? Is there a way to set a default path to insert subproject? You can divide a large project into smaller project and consolidate them by using Subproject command within Project 2013. This option is also used when you have cross dependencies between one project plan and another. The project help manual at http://office.microsoft.com/en-in/project-help/link-projects-to-create-a-master-project-HA102840089.aspx gives you step-by-step process to insert sub project to master project. The challenge is : How to send the master project and inserted projects? Should the client create the same exact folder as the one created by the sender when inserting the sub projects? The answer is as long as the master project and inserted projects are in the same folder when it was linked, you should be able to send the client the files. When the client opens the master project, files will link normally and be opened. Instead you can avoid this risk by creating a single file by removing the link between the master project and inserted project by selecting the insert project name, right click and select Information. Select the advanced tab and uncheck "Link to project" option. You have 5 days fixed duration task assigned to a resource. The task is completed ahead of time and actual work spent by the resource is 20 hours. When you update the actual work to 20 hours and remaining work to 0 hours, you will observe Project WILL NOT update percent complete to 100%. You will also notice the ellipsis character (…) at the end of the Gantt bar for this task, indicating there is uncompleted Remaining Duration on the task. Since the task is fixed duration, Project doesn’t reduce the total duration when the work is completed earlier. So, I would recommend you to begin looking for an ellipsis character at the end of any Gantt bar for an in-progress task. To resolve the problem, the PM should change the Task Type for the completed task to either Fixed Units or Fixed Work. This change will not matter because the task is completed. Once done, Microsoft Project will shorten the Duration to the correct time span for the completed work, will reduce the Remaining Duration to 0d, will enter the correct Actual Finish date, and will mark the task as 100% complete.